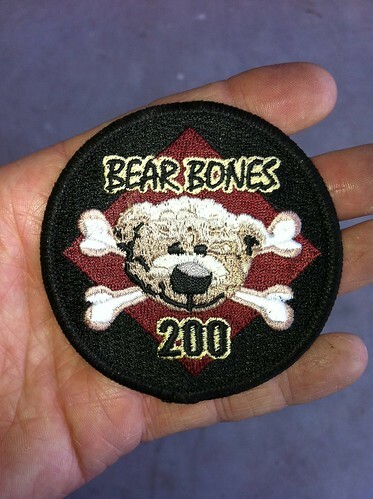 Before I tell you about the Bear Bones 200, you need to know about some things from earlier in the year. 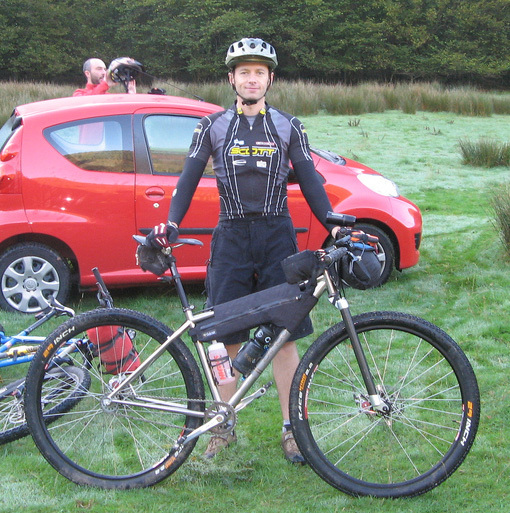 In May this year, I took part in 3rd Welsh Ride Thing (WRT), which is a three day bikepacking and navigation event run in aid of Wales Air Ambulance. A series of checkpoints are set across a wide area of Mid Wales, and you plan a ride of you own choosing to visit as many or as few as you wish over three days. I happened to spend most of it in the company of Aidan Harding. Within the right circles, Aidan is well known for a number of big achievements for long distant races such as the Tour Divide and Idita Bike. Indeed, for Idita Bike, he narrowly missed first place in the 1100 mile race to Nome, and posted the fastest singlespeed time for his second place finish. When he caught me up and suggested we ride together, I thought then that I would be in for a hard time. Here was a man who had ridden more miles in a month than I’d ridden all year, and who would go on to ride more miles next month that I would probably achieve for the remaining part of the year. It was slightly intimidating, but I dug deep and kept pedalling. The WRT course was tough this year. 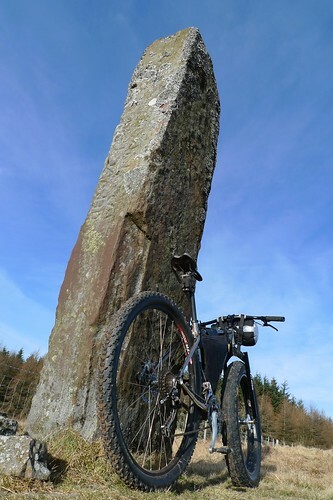 It took on very lumpy terrain north of Machynlleth, which anyone who has done the Dyfi Enduro will know. The first day took us out over Glyndwr’s Way along a surprisingly challenging route before we tackled the even more challenging 600m summit of Tarrenhendre in deteriorating weather conditions. We stopped eventually at a lower and calmer elevation with about 60 km ridden. The following day we were rolling for around 8am, which was fairly leisurely all things considered. Our day two route would take us right around the north side of Cader Idris and back into Dyfi Forest before eventually heading SE along more Glyndwr’s Way before making the link back over to the finish at Pennant. In all, we rode 92 km in about 11 hours. It was the furthest and longest I had ever ridden a singlespeed before, and I was suitably tired by the end of it. Though it only turned out to be two days of riding, it was really useful to pushed a bit in terms of distance and severity of riding. Aidan said he thought it was harder than a typical day on the Tour Divide, which was encouraging in many ways. If faced with a greater distance (with equal severity), I would take gears – no question. As such, I’d most likely be a bit quicker and/or not quite so tired at the end of the day. In August the inaugural Bear Bones 200 was announced: a 200km individual time trial starting and finishing in Mid-Wales and taking a challenging route south through Hafren Forest, Elan Valley, Twyi Forest, Devils Staircase, Coed Trallwm and back over to Elan Valley for a return route back through Hafren. For a bit of perspective, the route was half the distance of our Welsh Divide Trip and with 50% more ascent. You needed to be prepared for a night under the stars too, with a sleeping bag and bivvy bag being mandatory kit items. Don’t forget to take enough food with you either as the only places to get food were at 60 and 100 miles into the route. A week before the event was an announcement that anyone who completed the event would get a green badge. If you could get under 28 hours you got a blue one. The black badge is reserved for those who could get under 24 hours. Naturally, I would be aiming for a black badge. I also, for reasons I can’t quite identify but possibly related to my poor memory, decided to take the singlespeed. I feel like I’d waited years for this: to link up all those trails that I knew into one big tour to follow the spine of Wales from the north to the south – a Welsh Divide, if you will. From the top of the Great Orme to the end of Worm’s Head: 4 days, 430 km, 11,300m ascent. I’ve lost count of the number of days that have elapsed since I last rode my bike. Way back in August sometime, maybe, but I can’t be sure. But, despite the unfinished state of things its all very live-able in and that means, rain or shine (rain most likely – looking at the forecast), I’m off for two days riding in an often overlooked bit of Wales that is Radnor Forest. The Radnor Ring is a Sustrans route of 80 odd miles of quiet country lanes. Between these, however, is a great network of tracks, bridleways and forest trails that I haven’t ridden for over a decade or more, and certainly never has a nice big loop with a night out under the tarp. It’s also an opportunity to test out a couple of new bits of kit. Beth has finished a nice Clouded Leopard frame bag for me that fits around my water bottles and still gives me room for a tarp, bivvy bag, sleeping mat and a few other bits and bobs as well. It’s super light too, weighing only 150g. With sleeping gear up front and food etc in a seat pack, I should have a total weight of around 4 kg with nothing on my back. 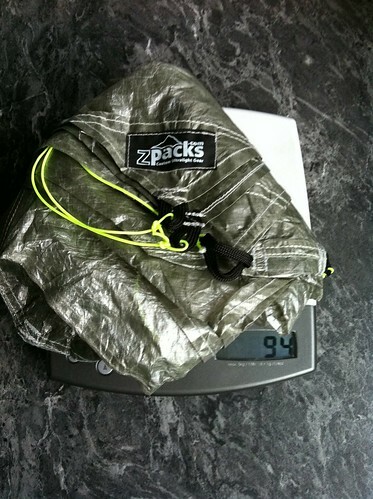 I’m also excited about my new tarp: 94g of cuben fibreness, this neat tarp is produced by z-packs in the US. Nearly half the weight of my siltarp, it should provide more protection from the rain and increased headroom allowing me to sit up out of the rain and eat my dinner. 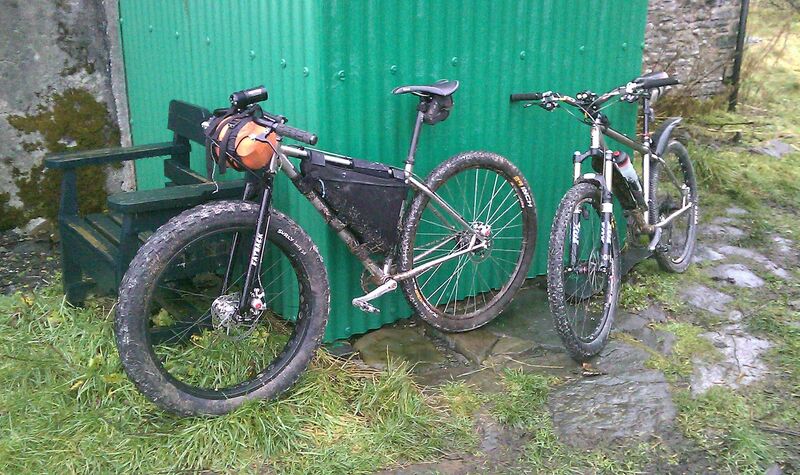 I’m just glad to be going out on the trails, regardless of the weather, and quite excited about my new bits of gear. It’ll be a great way to end my abstinence from riding bikes. How embarrassing. It’s nearly six months since I posted something here. You will, perhaps, be pleased to see that I’m still alive and if you cast your eyes rightwards towards to the twitter feed, things have indeed been happening. Finding the time to write more than 140 characters has been more of a challenge, and even up to 140 has been a stretch at times. I do sometimes lack the inspiration to write something interesting, and try not to blog for the sake of blogging, but Taylor said he was getting tired of looking at that stove review, so it’s time for something else. I’ve found myself doing a bit of bikepacking lately, and there are four trips that have yet to grace these pages. Running beside all that are some little make-you-own-gear (MYOG) projects that I want to share, and of course some pictures. I like pictures. The most important thing of all though is worthy of a post all of her own, but I’m going to save that one for little bit longer. Keep it as light weight as possible >> Using as little fabric as possible would help achieve this >> Using less fabric would keep the cost down >> If I use less fabric the packed volume will be less for any given fabric >> I should utilise the bike as a frame to pitch the tarp over to allow use in open areas if no tree cover available. I came across some fabric that was silicon coated on both sides, was cheap and dark green. 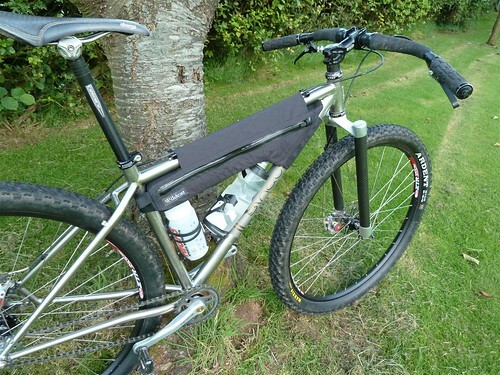 Having looked at numerous tarp set ups including some that used a bike as a frame, I worked out that I could use the wheels at either end of the tarp would use least fabric. I lay down to work out how much horizontal room I needed if I lay full length between each wheel. Being of average height, 2m was enough. I then figured that a 50cm flap over the wheel to a guy point would probably be sufficient. I ordered 3m of fabric, 1.5m wide. When I arrived, it measured 3.10m by 1.57m, which was a bit of a bonus in both directions I thought. It was soft, handled quite well and wasn’t particularly noisy when you flapped it about, like some spinnakers are. The fabric weighed 398g, which converted to a weight of 2.4 ounces per square yard. This gave me a comparison to other fabrics like ultrasil/ silnylon, which are typically 1.1-1.3 oz/sq.yd. The next step was to determine the shape the fabric needed to be when stretched over a wheel. With more time and a lot of thought, we could have gone to the trouble of stitching in tapered sections to allow a better fit over the wheel, but we decided against this in order to keep it simple. The obvious areas of excess fabric were going to the back corners, away from the front edge where the wheel was. We cut off two triangular pieces about 50cm by 75cm which gave us some extra fabric to reinforce the guy points. All the edge seams were folded over twice and double stitched. Some sections that were going to be under greatest tension were also reinforced with some gross-grain tape into the hem, with small loops at the ends to tie the guys to. We also stitched in a line of gross-grain between the front and back guy points, in line with the wheels for extra strength and added durability over an obvious contact point (the wheel). The finished product seems quite good. Though it’s not been out of the back garden yet, it was easy to erect and easy to get a good even tension. There are eight guy points which go out to six (titanium) peg locations. 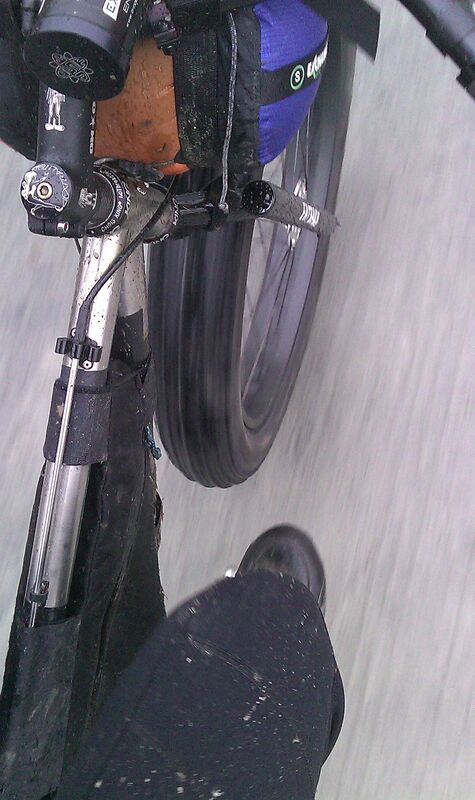 I’ve got 2.1m between each of the wheels, taking the extra 10cm of material supplied to give me more internal space. The rear tapered section where we took a triangle of fabric off didn’t work as envisaged, but instead allowed a sort of drop down at the back which would be more effective at keeping weather from coming under the edges. The fabric does go over the wheel quite well and does appear to have equalised the tension in the fabric very well without a lot of very tight or very slack areas of fabric.